Notes: Sunbow's H.I.S.S. Drivers wore the 1983 outfit with a less pronounced helmet crest, and the visor had a red outline and was no wider than the face mask. There were no wristbands, and the chest straps had a thick black outline. By chance, their appearance in The Funhouse made it into the first season's closing credits, so they were seen by viewers every day despite their scant use in the show proper. Also, a character resembling a blue H.I.S.S. Driver is seen (very briefly) parachuting from an exploding Cobra jet in A Real American Hero Part 4. COBRA H.I.S.S. drivers are selected from the best and most evil of COBRA Command's thousands of yearly recruits. Each is chosen for his physical strength and total dedication to evil! H.I.S.S. drivers are graduates of COBRA Battle School, Advanced Weapons Systems Training. Qualified Experts: H.I.S.S. Vehicle, FANG Copter, knowledge of all NATO and G.I. Joe weapons. COBRA H.I.S.S. drivers are committed to the destruction of G.I. Joe! This newly developed battle vehicle is a real match for the G.I. Joe team. Beware! Reissues: Reissued in mail offers 1987-1988 and 1992 (Chilling Events, Operation Blackout, End of Slaughter, Top Secret, Mission Rescue: Code Blue). In several of these brochures, his name is switched with that of Stinger Driver. This and his appearance in the Stinger in the G.I. Joe Bugle offer suggests Hasbro may have long confused these characters for some unknown reason. Accessories: black pistol (06 Med Alert's), dark red belt with black pockets (new), black Cobra figure stand. COBRA H.I.S.S. drivers are selected from the best and most evil of the COBRA organization's thousands of yearly recruits. Each is chosen for his physical strength and total dedication to evil! Every Cobra H.I.S.S. driver is a graduate of: COBRA Battle School, Advanced Weapons Systems Training. Qualified Experts: COBRA assault vehicles and helicopters, and knowledge of all NATO AND G.I. JOE weapons. COBRA H.I.S.S. drivers are committed to the destruction of the G.I. Joe team! The newly developed battle vehicles they operate are a real match for the G.I. Joe team. Beware! Accessories: black pistol (06 Med Alert's), dark red belt with black pockets (08 H.I.S.S. Driver's), black Cobra figure stand. COBRA H.I.S.S. drivers are selected from the best of the COBRA infantry forces for specialized training in how to operate these top-of-the-line armored tanks and use the vehicles' sophisticated electronics systems. They're chosen for their skills, physical strength, and initiative (which means they're some of the nastiest, toughest, and most aggressive troopers in the entire COBRA army). COBRA H.I.S.S. drivers are graduates of COBRA Battle School and Advanced Weapons Systems Training. "We are dedicated to destroying the G.I. JOE team and will crush them under the treads of our tanks!" 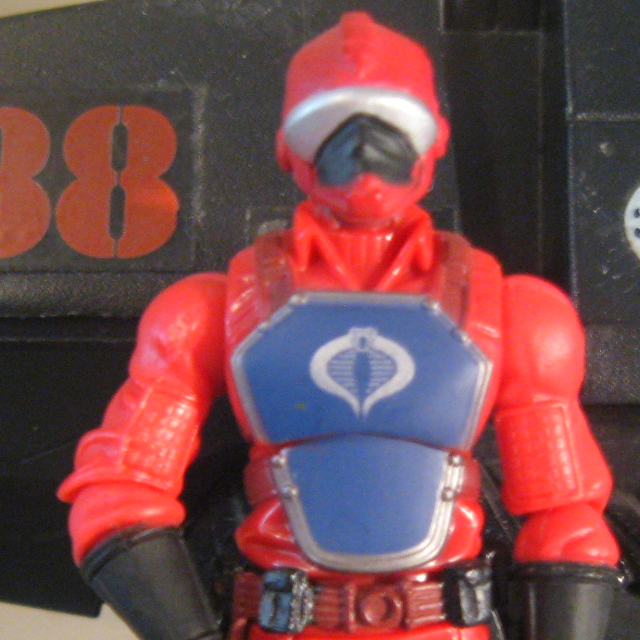 Toy Notes: Boxed in a Target-exclusive set with Cobra Vehicle Gunner, Destro, Cobra Commander, Short-Fuze, Steeler, Sgt. Stalker, a dark green M.O.B.A.T., a blue Flight Pod, and a red H.I.S.S. Tank. Item #34106.